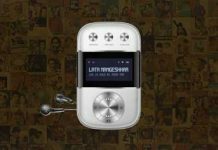 Chennai : Daimler and Anna University (AU) celebrated innovation with their first collaboration, the ‘Daimler AU Mobile App Garage’, organized by Anna University’s Centre for University-Industry Collaboration, Chennai, and supported by Daimler India Commercial Vehicles and Daimler Financial Services India. 500 students from over 20 colleges across India had made submissions on the topics of strategic digitalization and mobility, of which the best 42 were invited to participate in the final hackathon event in Chennai. The 1st prize was awarded to the team ‘GreenBage’ who developed a prototype to conveniently notify residents on the arrival of garbage trucks, and hence preventing unwanted disposal of waste by the roadsides, or overloading garbage bins. Their prototype includes vehicle detection (GPS) and dynamic mapping. Further potential use cases of the application range from public transportations notification to warehouse logistics. The winners were awarded by Dr. S. Ganesan, Registrar, Anna University, Mr. Erich Nesselhauf, MD and CEO Daimler India Commercial Vehicles and Mr. Fred Weick, CEO Daimler Financial Services India. The winners of the Hackathon were decided by a panel composed of expert representatives from Daimler and Anna University. The winning team received a cash prize of INR 1, 00,000. The runners-up, team ‘Kaizen’, presented a promising application for improving communications processes in sales & marketing functions while the third award winner ‘Driver Assist’ demonstrated an app based solution which will help truck driver manage their trips better using connectivity. A special award was awarded to the team ‘FiAMApp’, who built a VR solution for customer interactions. 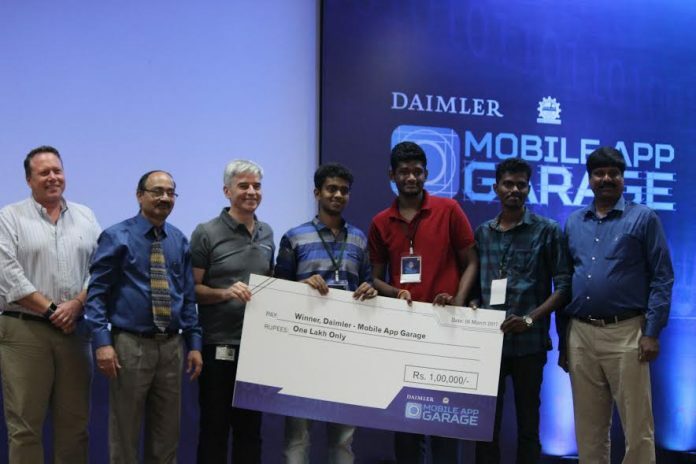 The call for entries for the Daimler AU Mobile App Garage went out in November 2016, leading to over 500 submissions from over 20 colleges across India on the topics of strategic digitalization and mobility. Based on pre-defined success parameter, 42 shortlisted candidates were invited to the final event held from 4th to 6th March 2017 in Chennai – including a tour of Daimler’s Oragadam plant and mentoring sessions with Daimler experts and workshops. In the 24 hours coding event, the participants then faced a herculean task: testing their solutions extensively and programming a prototype in the space of a day. During the 24-hour development phase, the participants worked in self-organized teams of three as they developed many excellent ideas that reflect not only the business needs of Daimler but also solutions relevant for India.